Mehmed II (Ottoman Turkish: محمد ثانى‎, Meḥmed-i sānī; Modern Turkish: II. 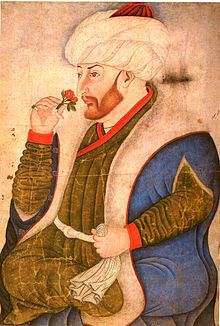 Mehmet Template:IPA-tu; 30 March 1432 – 3 May 1481), was Sultan of the Ottoman Empire for a short time from 1444 to 1446, and later from 1451 to 1481. At the age of 21, he conquered Constantinople, bringing an end to the medieval Byzantine Empire. Wikimedia Commons has media related to Mehmed II. This page was last changed on 15 November 2018, at 17:18.